My skin color is an undeniably integral part of who I am. It has a crucial effect on my experiences and sets the tone for how the world treats me. It shows my heritage, my ancestors, and my struggles. I need you to see my brownness. The rest of society makes it blatantly clear what they think of me because of my skin color. I am not granted the privileges, passes, second chances, or leeways that are freely given to my white counterparts. Racism is so deeply ingrained into my life that I expect it to stain my daily interactions. It does not shock or surprise me to deal with racism anymore. If I point out that your white privilege is what allows you to believe that we live in a post-racial world, that is not me perpetuating race issues. I am simply trying to explain my perspective to you and make you understand that your reality and my reality are vastly different. Claiming to be "colorb***nd" to race means you don't see why I experience the world the way that I do. Pretending that racism isn't as prevalent and insidious as it truly is means that you do not see my struggle for what it really is. You say: "I don't see color." I hear: "I don't see you." If you don't see my skin color, then how do you believe me when I say I get treated worse than you because of it? How can you understand the stark truths about racism if you refuse to see the reason for our treatment? 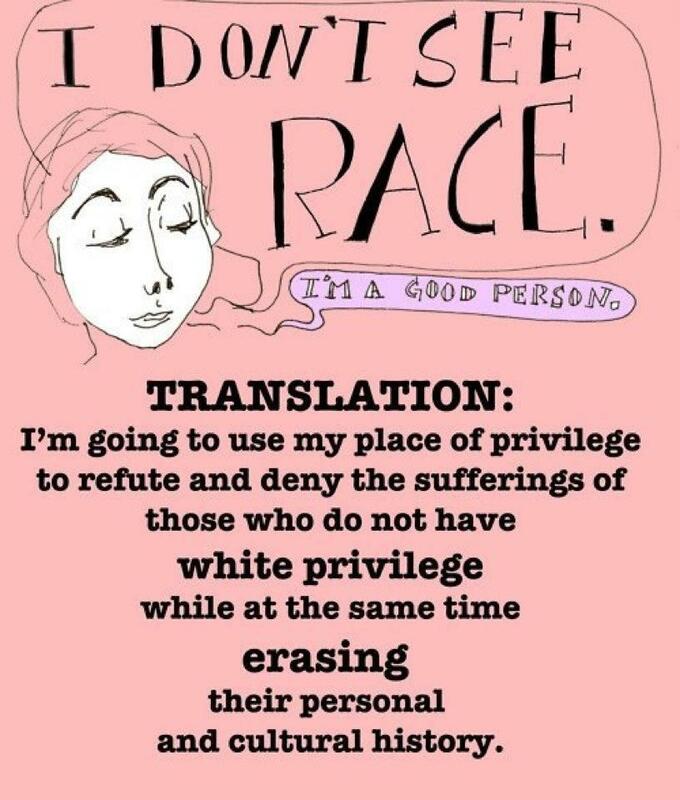 It is an immense privilege to be able to ignore race. Being able to think you live in a world free from racism stems from the fact that the oppression of being a PoC has never touched you. Your persistent claim that you see all people as equal is damaging and toxic. The white community needs to acknowledge it's privilege and begin to unpack the harm it causes with it's dismissiveness. We are loud, active, and relentless in our advocacy because of people like you. We need you to see the unfairness and work with us at correcting it. You learning to sit and listen is critical to the social justice movement. We are speaking from experience, you are speaking from privilege. Learn the difference!